Sponsored Schools This search will connect you with accredited schools offering the type of degree you are looking for. We receive a small marketing fee from these schools, which helps make the work that we do possible. We do not accept paid placements for any of our rankings. Healthcare may have the fastest growing career opportunities in the United States. Thanks, in part, to the Affordable Care Act, millions of previously uninsured Americans are now able to access care and are doing so in record numbers. Another contributing factor in the growth and stability of healthcare careers comes as the Baby Boomers, born post World War II from 1946 to 1964, are aging and creating a rapid increase of older patients needing more health related care. Healthcare today requires more than just physician and nurses; but, a wide range of auxiliary and support professionals is required to meet quality patient care outcomes. These careers include, but are not limited to: direct patient care givers, technologists trained in laboratories, diagnostic and medical equipment and pharmaceuticals, social services, administrators/managers, community health educators, nutrition and dietary support and research, etc. Depending on your interest, qualifying education for healthcare fields range from certificates to doctorates. While some entry level careers are available for those holding high school, Associate degrees or specialized certification, a majority of employers will prefer a Bachelors Degree from an accredited school or university; and, often, licensure and professional certification is required before you'll be able to practice. Be certain to verify through your state regulatory board if your degree will satisfy licensing requirements, if needed. Best Medical Degrees offers the following career options for students holding a Bachelors Degree wishing to work in the health field. Colleges and universities have increased their online degree offerings in order to meet the increased demands for qualified healthcare workers; and, most students are able to complete their degrees online. It's advised that your search focus on accredited programs that will meet your state's individual licensure requirements if necessary; and, that your degree meets the highest educational standards. If you're currently employed in a healthcare field and want to further your education, many employers offer tuition assistance and it would be beneficial to check with your Human Resource department to see if you qualify. Additionally, state and federal financial aid is available for eligible students. To investigate potential assistance, contact your school's Financial Aid Office. Most often, this aid comes in the form of grants or low interest loans. Best Medical Degrees has reviewed medical degrees requiring a Bachelors degree based on salary expectations and job projections as cited by the Bureau of Labor Statistics, Forbes Magazine and U.S. News and World Report. The rankings listed are from highest salary expectations to lowest. The role of a Medical Perfusionist is to assist surgical teams during cardiac and pulmonary surgeries. Operating a heart/lung machine (equipment that artificially replaces heart or lung functions during surgery) perfusionists are an integral part of the surgical team. Perfusionists monitor and correct the patient's status by administering various blood products to the patient, regulating different medications, and observing and controlling the patient's temperature during surgery. Students study courses in biology, chemistry, anatomy and physiology, as well as additional specialized training to satisfy the requirements of certification and licensure. According to Forbes qualified perfusionists can earn $93,500 annually. Requiring skills in leadership, organization, communication and analysis, Medical and Health Services Manager positions will be in high demand over the next ten years. With a median salary of $92,810, according to the Bureau of Labor Statistics, there's an estimated 17% increase expected with nearly 333,000 position openings between 2014-2024. Medical and Health Services Managers work in acute care hospital settings, outpatient clinics, government offices and home health care agencies. A BS or BA in Health Administration often includes courses in health services management, accounting and budgeting, human resources administration, strategic planning, law and ethics, health economics, and health information systems. As research in oncology treatments advance, more clinical trials are added to determine the safety and efficacy of new chemotherapy drugs or other treatments (such as the use of lasers). These trials are closely monitored by hospitals offering clinical trials and must meet specific requirements by the National Institute of Health, pharmaceutical companies and healthcare clinics. A Bachelor of Science in Nursing (BSN) is the minimum requirement to become a Clinical Trials Manager. These nurses work closely with physicians to precisely administer drugs and monitor chemotherapy treatments. Most nurses who wish to become Clinical Trials Managers work in oncology for a few years and obtain certification. According to the Bureau of Labor Statistics, the estimated salary for these managers is $92,600 annually and has a strong 17% projected job growth during 2014-2024. With an impressive estimated 23% job growth rate over the next decade, Biomedical Engineers merge medical and biological sciences to design and create devices, equipment, computer software and systems used in diagnosing and treating patients. Median salaries for these engineers is $86,950 and they may find employment in a variety of areas, including hospitals, universities, medical institutions, medical technology industries and government agencies. Analytical, math and communication skills are key, along with creativity and problem solving abilities are key elements in a Biomedical Engineer. Computer technology is playing an ever increasing role in the delivery of healthcare, maintenance of healthcare records, state and federal reporting requirements and medical reimbursement concerns. As more hospitals begin to rely on electronic patient medical records, the integrity, security and privacy of patient records is critical in the proper administration of medication, therapies, patient outcomes and accurate recording. Students with a bachelor degree in computer science can find work in hospitals, physician offices, federal agencies and insurance companies; and, IT specialists can anticipate a median salary of $88,890 with an above average 18% job growth. At first glance, Medical Geography may seem an odd choice for a ranking of healthcare careers; but, if one thinks of how disease spreads in the 21st century, it begins to make more sense. Medical Geographers are specialists in a larger occupational field of human geography and specialize in the investigation of health issues and the spread of disease. Take as an example, the spread of Ebola in 2015 or the annual influenza outbreaks. Medical Geographers may be called on to analyze geographic distribution of diseases and occurrences using geographic information systems to assist healthcare specialists in managing the disease. The BLS estimates a median salary of $83,180 annually and Medical Geographers benefit from excellent critical thinking, analytical and computer skills. A Bachelor of Science in chemistry can qualify students for entry level positions in pharmaceuticals manufacturing, research and development industries, federal agencies or testing laboratories. Average annual salaries for a BS in chemistry is $74,720 with an average job growth of 3% which is somewhat slower than average nationwide. Undergraduate chemistry majors typically are required to take courses in analytical, organic, inorganic, and physical chemistry.Computer science courses are useful as are courses in mathematics, biological sciences, and physics. Working in hospitals, outpatient diagnostic centers and medical and diagnostic centers, students trained in Nuclear Medical Technology can expect to earn upwards of $72,100 in this field with a 20% projected ten-year job growth. These technicians work with patients to explain procedures, prepare radioactive drugs and administer them for tests, monitor patients and follow all safety procedures. A rapidly growing field, thanks to increased technology and application, students may choose to specialize in PET imaging or nuclear cardiology. Occupational Health and Safety specialists work to insure employee safety in offices, laboratories, hospitals and industry. With an average $69,210 salary, this career protects workers or patients by inspecting workplaces for chemical, physical, radiological, and biological hazards; and, governmental specialists may impose fines for infractions. Courses studied for this degree study radiation science, hazardous material management and control, risk communications, and respiratory protection. With a median income of $67,790, students interested in this field can find employment in hospitals, research laboratories, pharmaceutical and medicine manufacturing or state and federal government agencies. Microbiologists examine microorganisms such as viruses, bacteria, parasites and fungi to determine how they grow, live and impact our environment. A bachelors degree in microbiology is required for entry level positions. The overall job growth expectation for Microbiologists is approximately 4% but is expected to remain steady in basic research over the next ten years. The Bureau of Labor Statistics estimates a staggering need for over 2.751 million nurses over the next ten years. Prompted by the increase in insured patients, the aging Baby Boomer generation and medical research and technology, BSN prepared nurses can expect to earn an estimated $66,640 annually and be in high demand. Nursing roles have expanded to include not only inpatient care, but careers in physician offices, outpatient clinics, home care services, schools and business and long term care facilities. Requiring compassion, physical stamina, attention to detail and superior organizational skills, a BSN is a strong base for nurses who wish to continue their education for managerial positions. A relatively new healthcare career, the Healthcare Compliance Officer is responsible for maintaining and assuring that hospitals, physician offices, long term care facilities, etc., meet all state and federal regulations for patient care. With the passage of the Health Insurance Portability and Accountability Act (HIPAA) in 1996, strict compliance with guidelines and patient privacy are mandated. The Healthcare Compliance Officer's job is to investigate reports of noncompliance, conduct training in proper reporting and activities and to take corrective action to bring the institution into compliance as defined by the federal Office of Inspector General. The median salary for this position is $64,958. Certification is recommended to become a compliance officer and attention to detail and the ability to interpret and communicate federal regulations are helpful. As hospitals, and hospital systems, continue to grow, there is often a need for a Public Relations Specialist to assure accurate and timely information is released to the public by the hospital. These particular PR Specialists are required to understand specific HIPAA regulations regarding patient privacy and release of patient records, beyond the normal job requirements of the field. Often, these specialists are required to create and publish patient education pamphlets, publish employment ads in newspapers and journals, manage social media releases, serve as spokesperson for the facility and cooperate with local, state or national media. The average income for a PR Specialist is $55,680 and has a 6% job growth rate which is as fast as average by the Bureau of Labor Statistics. The aging population in the US is requiring more healthcare professionals who specialize in nursing, as well as healthcare management. Families and individuals need assistance in navigating the complex medical world and rely on trained professionals. A BSN is required along with specialization studies in gerontology, counseling and care management. This career path also requires certification through the National Academy of Certified Care Managers (NACCCM). The job outlook for this profession is strong and the median salary is $54,000, based on experience. The role of nutrition and diet has become a growing healthcare field over the past decade and is continuing to grow at a 16% rate, according to the BLS. Nutritionists may find employment in hospitals, residential centers and outpatient care clinics (such as oncology, dialysis or diabetic centers). They create nutritional programs based on health needs of patients and work with physicians and nurses on supporting good patient outcomes through nutrition. Many clinical nutritionists may further specialize in areas such as renal disease, oncology, pediatrics or even genetics. Average annual salaries for students with a BS in Nutrition Science is around $59,950 and the Bureau of Labor Statistics estimates a higher than average, 16% job growth in this field. New healthcare pharmaceuticals and medical equipment and devices are constantly being developed or improved. Sales Representatives are the initial point of contact and training between the companies, creating these new drugs and equipment, and hospitals, physicians and outpatient clinics. While sales doesn't necessarily require a college degree, healthcare companies prefer employees with college degrees in a field related to the product sold, such as chemistry, biology, or engineering. Salary median for this technical sales career is $58,380 per annum. Human Resource Specialists in healthcare are responsible for assuring that all employees in a hospital, physicians' group or outpatient facilities have the appropriate credentials and licensure for clinical and nonclinical positions. Most HR Specialists have an educational background in human resources, business or a related field; and, many specialists obtain on the job training in specific healthcare regulations and policies. HR Specialists in healthcare may be required to recruit qualified job candidates, conduct employee orientation programs and verify continued licensure and eligibility of clinical employees. Certification as an HR Specialist is sometimes required. The Bureau of Labor Statistics cites a median salary of $57,420 for these positions. With a median salary of $56,730 and a 12% job growth expectation over ten years, Respiratory Therapy is a solid career choice for those interested in patient care. Working in hospitals, physician offices or outpatient clinics, therapists provide diagnostic tests and treatment using a variety of methods such as chest physiotherapy and aerosol medications for patients diagnosed with Chronic Obstructive Pulmonary Disease (COPD), asthma or emphysema. Respiratory Therapists' patients may include infants with underdeveloped lungs, patients who have suffered a heart attack or elderly with chronic breathing problems. Working in hospitals, outpatient diagnostic clinics and physicians offices, Radiologic and MRI Technologists work with physicians to provide diagnostic images used in patient care. Using sophisticated, computerized equipment, such as CT scanners, MRIs, PET scanners, etc., these technicians prepare patients for procedures, including taking a medical history and answering questions about the procedure. These technologists may also perform mammograms and X-rays. The BLS estimates a 9% growth in these positions and a median salary of $57,370 for licensed and certified technicians. This degree qualifies a student to become a public health consultant, physician office manager or school health teacher. Estimated salary for this profession is $54,120 and is expected to grow at around 12% over the next ten years. Coursework for this degree may include adult health issues, public mental health concerns, substance abuse and research in public health topics. Students holding a BS in Health and Wellness may need to obtain licensure or a certificate for certain positions. 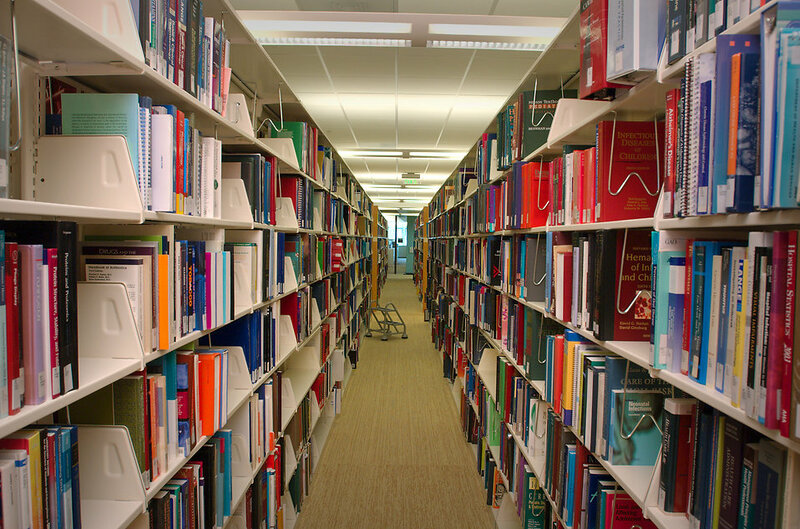 Many Medical Librarians have masters' degrees in Library Science, but jobs exist for students who hold a bachelor's degree in Library Science, as well. Working in hospitals, government agencies, college and universities, Medical Librarians assist medical professionals in conducting general research or specific disease-related research. The Bureau of Labor Statistics estimates an annual salary of $56,170 for this profession. Students holding a Bachelor of Social Work (BSW) work as caseworkers or mental health assistants and may work in home care, hospitals, physician offices, long term care facilities or government agencies. Entry-level positions have a median salary of $45,500 and a projected 12% job outlook from 2014-2024. Social workers evaluate client needs and develop plans to access resources and programs to help in a variety of situations, ranging from illness, divorce, unemployment, or obtain government services to help ease their particular situation. If you have an interest in technology, an attention to detail, physical stamina and an ability to multi-task, this may be the career for you. With a 16% estimated job growth and median annual salary of $49,310, Clinical Laboratory Technicians may find employment in hospitals, diagnostic and medical clinics and physician offices. Technicians analyze body fluids, study blood samples for use in transfusions and operate sophisticated laboratory equipment, such as microscopes and cell counters, use automated equipment and computerized instruments, discuss results and findings of laboratory tests and procedures with physicians. Coursework includes chemistry, biology, microbiology, math, and statistics; and, also emphasizes laboratory skills, including safety procedures and lab management. Working in medical laboratories, hospitals or diagnostic centers, Cytotechnologists may perform many types of tests such as fine needle aspirations. Cytotechnologists are scientists specializing determining the presence or absence of disease at a cellular level. This study includes cancerous and precancerous cells as well as signs of infection. Cytotechnologists may perform RNA or DNA testing, that may be used in disease treatment, diagnosis or genetic counseling. Earning approximately $49,310 annually, the Bureau of Labor Statistics projects career growth for this field at 16% over the next decade. Medical Illustrators work in hospitals, medical schools, law firms, or medical publishers or independently. Medical Illustrators are often called on by physicians and medical schools to illustrate specific medical details and models used in teaching, lectures and journal publications. Artists interested in becoming a Medical Illustrator are required to study biology or zoology, anatomy, physiology, cell biology, chemistry, as well as courses in painting, graphic design, illustration, color theory, and computer graphics. Median salary in this field is $44,400. Following disability or injury, such as a stroke, people sometimes need help in resuming day to day activities. Utilizing a variety of activities, Recreational Therapists work with patients in therapy sessions employing arts and crafts, music, dance, sports and drama to help improve the patient's physical and social well-being. Recreational Therapists are specially trained to assess the individual needs of a patient to relearn skills lost as a result of a stroke, accident or other illness. Working in hospitals, outpatient clinics or long term care facilities, Recreational Therapists average an annual $44,000 and the job prospects are strong at 12% over the next ten years. Public Health Educators focus attention on providing the community with information regarding wellness, assessment of the health needs of communities, create programs to educate people on managing health conditions and evaluate program effectiveness. Public Health Educators may also find employment in hospitals, local and state governments, nonprofit organizations or home care. The BLS estimates a ten year job growth at 13% with an average salary of $42,450. Helpful skills for Public Health Educators include analytical, problem solving, interpersonal and instructional abilities. Assisting in laboratories, Biological Technicians work with scientists in conducting medical tests and experiments. Technicians are responsible for the preparation of samples for analysis, gathering data and interpreting results and writing summarizing reports. Technicians work in teams, under the supervision of scientists, using traditional laboratory equipment and computers to analyze and understand data. These technicians are key in developing research and development for finding cures for diseases. The BLS estimates job growth for Biological Technicians to be around 5% over the next ten years with salary averages of $41,290. More than 2.7 million Americans suffer from drug addiction and The U.S. Bureau of Labor Statistics projects job growth for Abuse and Behavioral Disorder Counselors to be around 22% between 2014-2024, with a median salary range of $39,270, depending on the setting. These bachelor prepared counselors, work in a variety of settings from outpatient clinics to acute care facilities and are licensed by individual states to practice. Job growth in this field is due, in part, to the number of addicted Americans and increased access to healthcare. Additionally, more states are seeking treatment options for offenders rather than jail time. Students at the bachelor's degree level may consider addiction studies, psychology, behavioral science or other related majors. Coursework relevant to addictions counseling includes decision making, human development, applied statistics and social psychology. Patient information is a key factor in providing quality patient care and meeting stringent hospital and government guidelines. Health Informatics specialists are responsible for the management of health information data by ensuring that it maintains its quality, accuracy, accessibility, and security in both paper files and electronic systems. Accuracy of patient information is critical in the reimbursement of insurance claims and reimbursement by Medicare or Medicaid. Students pursuing this track can expect to study legal and ethical issues, quality assurance and management, systems and database design, healthcare statistics and medical terminology. The median salary for this career is $39,900 annually with an expected job growth of 15% nationwide. The EV-D68 Virus: Reason to Panic? Is Medical School Worth it Financially?